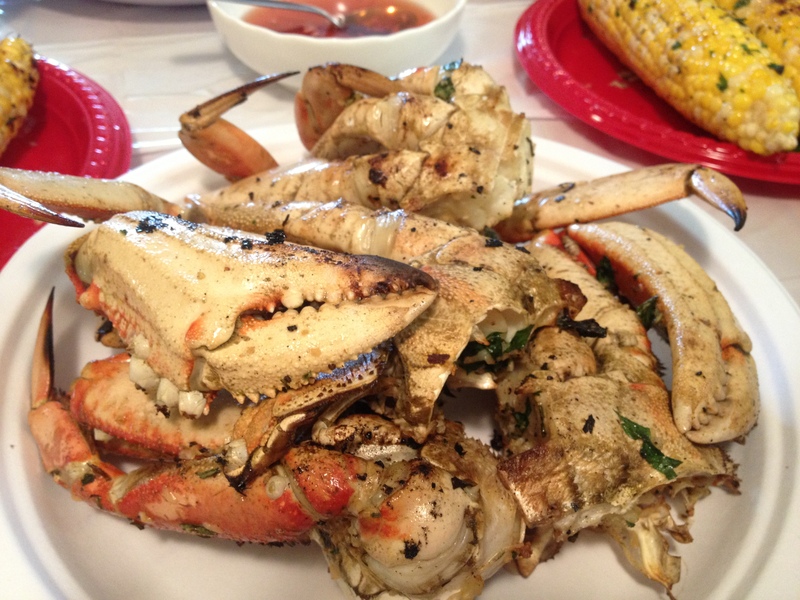 a few weeks ago, i decided to experiment a new way of eating dungeness crab. typically, i’ll just steam the crab for 10-12 minutes and eat it plain or sometimes with a red vinaigrette with chopped shallots sauce. but since summer grilling season has started, i thought it’d be neat to try out the flavor of grilled dungeness crab. in order to grill the crab, you have to take the head off the crab….along with the brains and guts. but since i bought live crab, there was absolutely no way i was going to yank off the head of a live crab. so, i cheated and steamed the crab for 6-8 minutes, carefully peeled off the head (saving the yellow brain juice to drink later), and cut the crab into quarters. for the seasoning, i melted half a stick of butter, added 1.5 tablespoons of minced garlic (the kind that comes pre-minced in a jar and sits in liquid), 3 tablespoons of finely chopped parsley, 1 teaspoon of pepper, and a few dashes of cayenne pepper. then i brushed the crab legs with the seasoning and placed it on the grill. since the crab was pretty much already cooked, it didn’t need much time on the grill. just enough to get some charring, about 5-7 minutes. by far one of the messiest but most delicious ways i can think of on how to eat dungeness crab. and licking your fingers for all that garlic-butter flavor made it even that much better. will definitely repeat this again in the future. Con la ayuda de llos tramposos, podemos jugar más rápido y más rápido.